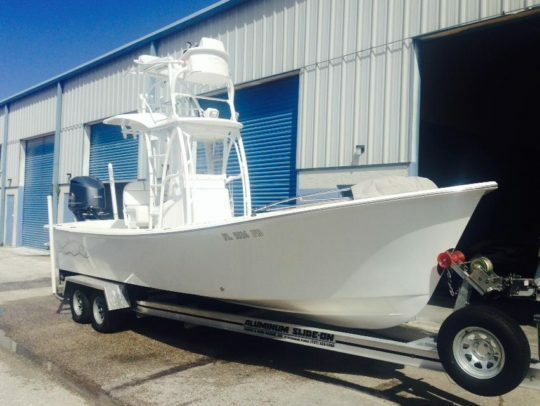 2011 Gause Built 26 – This 26 is powered by a V6 300 Yamaha and has virtually every option . This boat has a full tower powder coated white with Custom GB hardtop and folding option Garmin 5212 touch screen in lower station , Garmin 4208 in upper station and a great stereo system with 6 JL Audio speakers and a new Fusion stereo deck with Ipod and Blue Tooth . This boat also has dive platforms, 8 ft Power Pole , fresh water wash down , Minn Kota trim tab trolling motor system , Stealth onboard charging system , full interior lighting package and Custom GB tackle center leaning post with slide out Frigid Rigid cooler . For the family cruising comfort this boat has the dodger top with full front deck cushion set , tower enclosure and coaming pads all around . This boat also comes with a custom full boat cover that covers the topside as well as the tower in the up position .